Normally, you are used to feeling hungry several times a day. As humans, it is normal to want to eat food regularly. When you do not have this sensation, it can be extremely unnerving. While it may not be from anything major, there are some problems that can cause you to feel full without eating. Often, these conditions affect the stomach or the liver. If you cannot find out the exact cause and this symptom does not go away, you should talk to your doctor and make sure that a more serious underlying condition is not at fault. There are a number of things that can cause feelings of fullness without eating. The following 10 are some of the most common reasons for this problem. Your hormones signal your body to make changes. Sometimes, hormonal fluctuations can cause problems like not feeling hungry. Women who are experiencing early pregnancy or premenstrual syndrome may have hormonal changes that cause them to feel less hungry. At these times, your progesterone levels rise so that your guy digests food slower. This may lead to common symptoms like feeling particularly full, bloating and constipation. If this is the cause of your feeling full without eating, your symptoms will go away once your hormones adjust to normal. Indigestion is by far one of the most common reasons why you might feel full even if you have not eaten anything. Indigestion happens when acid in your stomach irritates your esophagus, stomach lining or duodenum. With minor indigestion, you may feel a burning sensation. You may also experience symptoms like belching, bloating, feeling full, vomiting, nausea, flatulence and stomach pain. To help remedy this problem, avoid caffeine, acidic foods and spicy foods. Instead, focus on eating plenty of fiber because fiber can help your body digest food properly. If nothing seems to help your indigestion, make sure to go to your doctor to see if another condition could be causing the problem. Doctors do not yet know why irritable bowel syndrome happens. What is known is that it affects your color and can cause painful symptoms like diarrhea, flatulence, constipation, abdominal pain, cramping and bloating. The symptoms can be extremely severe, although irritable bowel syndrome rarely causes long-term damage. If you have this condition, talk to your doctor about diet and lifestyle changes that you can make to help alleviate these symptoms. Celiac disease is a digestive disorder that affects your small intestine. It can cause a hypersensitivity to gluten within your intestines that makes it hard for you to digest foods that contain gluten like bread or baked goods. If you have Celiac disease, you may experience unexplained weight loss, bloating, diarrhea, stomach pain, fatigue or flatulence. This condition is technically considered an autoimmune disorder. This is because the immune system reacts to gluten as an outside invader or a threat. This immune response causes digestive problems and can make it harder for your body to absorb nutrients. Liver disease can be life threatening, so it is important to seek treatment right away if you think that you have liver disease. Alcoholism and narcotic abuse are two common risk factors that increase the chances of having liver disease, but anyone can develop it. Once you have liver disease, you may notice symptoms like cholestatis, dark urine, feeling full without eating, an enlarged gallbladder, easy bleeding and pale stools. Cholestasis is the medical term for when the bile created by the liver for digestion is stopped or stymied. Gastroparesis is a type of stomach problem. Commonly, it is known as delayed gastric emptying. It affects the vagus nerve which is responsible for making your stomach contract and release food into the lower intestine. This is extremely important for your digestive system, so someone with gastroparesis can cause your digestive system to stop functioning properly. You can end up feeling full without eating because you are full—your body has still not processed the food that you ate previously. Gastroparesis can be caused by vagus nerve surgery, smooth muscle disorders, infections and metabolic disorders. While ovarian cancer is a less common cause of feeling full without eating, it can happen. Ovarian cancer is notoriously difficult to detect. Often, the earliest signs of ovarian cancer include bloating, abdominal pain and problems eating. You may feel full without eating because of the bloating. If you think that you could have ovarian cancer, you need to get checked out by a medical professional. This cancer is best treated early, but it is hard to spot early—early detection is key to a healthy recovery. 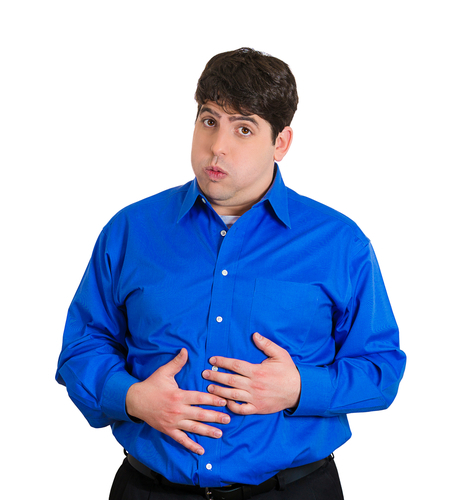 Peptic ulcers are another one of the most common causes of feeling full without eating. A peptic ulcer is a type of lesion that develops in the lining of the stomach. It can cause burping, regurgitation, discomfort, pain and bloating. The ulcer develops because stomach acid damages the stomach lining. In addition, a certain bacteria has been linked to many cases of peptic ulcers. Individuals who are on non-steroidal anti-inflammatory medication like aspirin or ibuprofen for multiple days are more likely to develop a peptic ulcer. Other risk factors like drinking alcohol and smoking cigarettes can increase the chances that an ulcer will develop. Constipation is medically considered a time when you have three or less bowel movements every week. Once you do have a bowel movement, it may look hard and dry. Constipation is fairly common, and it is often nothing to worry about unless it continues for an extended of time. Certain foods like fruit, vegetables, whole grains, oats and seeds can help reduce constipation issues. Exercising and drinking water can also prevent future bouts of constipation. Flatulence, or gas, can cause your stomach to feel bloated. In addition to causing abdominal pain, it can also make you feel full without eating. Flatulence happens to everyone and is normally nothing to worry about. While you may not like the smell or the side effects, they will go away unless there is another medical condition that is causing the flatulence to occur. Next articleDoes Hair Dye Kill Head Lice?